At higher altitudes, where 90 percent of our planet's ozone resides, it does a remarkable job of absorbing ultraviolet radiation. Bad Ozone- In the Earth’s lower atmosphere, near ground level, ozone is formed when pollutants emitted by cars, power plants, industrial boilers, refineries, chemical plants, and other sources react chemically in the presence of sunlight. Ozone at ground level is a harmful pollutant. Ozone pollution is a concern during the summer months, when the weather conditions needed to form it—lots of sun, hot temperatures— normally occur. Because it reacts strongly with other molecules, large concentrations of ozone near the ground prove toxic to living things. 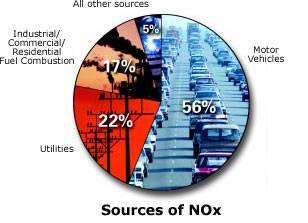 Motor vehicle exhaust and industrial emissions, gasoline vapors, and chemical solvents are some of the major sources of NOx and VOC, also known as ozone precursors. Strong sunlight and hot weather cause ground-level ozone to form in harmful concentrations in the air. Many urban areas tend to have high levels of "bad" ozone, but other areas are also subject to high ozone levels as winds carry NOx emissions hundreds of miles away from their original sources. The amount of ingredient gases. 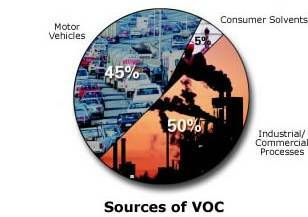 More ingredient gases (VOC's and NO2) can mean more ozone. Towns and cities that have more traffic or more industrial plants have a higher potential for ozone formation, especially towns that also experience many warm sunny days with little wind. Weather and Seasons: warm sunny days mean more ozone. Since sunlight and heat are the engines that drive ozone formation, warm sunny days should have more ozone than cool or cloudy days. Wind can also play a role. On windy days the wind can disperse the ozone, causing levels to drop. Ozone pollution can be especially bad during summer heat waves when the air does not mix very well and air pollution doesn't disperse. Time of Day: ozone levels build during the day. On a clear day, ozone levels can continue to rise all day long, and then decrease rapidly after sunset. Since heat, sunlight, the ingredient gasses each usually increase during the day, ozone formation also increases. When the sun goes down, there is no energy for ozone formation and fewer ingredient gases - so ozone levels drop. The AQI tells you how clean the air is and whether it will affect your health. Through AIRNow, EPA, NOAA, NPS, state, and local agencies work together to report current and forecast conditions for ozone and particle pollution. Ozone in the air we breathe can harm our health—particularly on hot, sunny days when ozone can reach unhealthy levels. Even relatively low levels of ozone can cause health effects. People with lung disease, children, older adults, and people who are active outdoors may be particularly sensitive to ozone. Ozone exposure may also increase the risk of premature death from heart or lung disease. This fact sheet tells you how you can find out when air quality is unhealthy and take simple steps to protect your health. Ozone occurs naturally in the Earth’s upper atmosphere (the stratosphere), where it shields the Earth from the sun’s ultraviolet rays. At ground-level, ozone is an air pollutant that can harm human health. Does my area have high ozone levels? Ozone is particularly likely to reach unhealthy levels on hot sunny days in urban environments. It is a major part of urban smog. Ozone can also be transported long distances by wind. For this reason, even rural areas can experience high ozone levels. The Airnow Web site at airnow.gov provides daily air quality reports for many areas. These reports use the Air Quality Index (or AQI) (shown on the first page) to tell you how clean or polluted the air is. Inflame and damage the lung lining. These effects may lead to increased school absences, visits to doctors and emergency rooms, and hospital admissions .Research also indicates that ozone exposure may increase the risk of premature death from heart or lung disease. Who is sensitive to ozone? Some people are more sensitive to ozone than others. Sensitive groups include children; people with lung disease, such as asthma, emphysema, or chronic bronchitis; and older adults. Even healthy adults who are active outdoors can experience ozone’s harmful effects. What is an Air Quality Action Day for Ozone? Your State or local air quality agency may declare an Air Quality Action Day for Ozone when ozone levels are forecast to reach unhealthy levels. On ozone action days, you can take simple steps (see below) to reduce the pollution that results in ground-level ozone. Conserve energy-home at work,everywhere. Turn off lights you are not using. When air quality is healthy, bike or walk instead of driving. Combine errands to reduce vehicle trips. When refueling: Stop when the pump shuts off. Putting more fuel in is bad for the environment and can damage your vehicle. Avoid spilling fuel. Always tighten your gas cap securely. Keep your car, boat, and other engines tuned up. Inflate your car’s tires to the recommended pressure. Follow manufacturers’recommendations to use and properly seal cleaners, paints, and other chemicals so smog-forming chemicals can’t evaporate. Refuel cars and trucks after dusk,when emissions are less likely to produce ozone. Delay using gasoline-powered lawn and garden equipment until air quality is healthy again. Delay using household, workshop, and garden chemicals until air quality is healthy again.